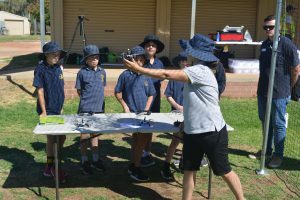 There was a buzz of a different kind at Narrogin Primary School recently as 24 students enjoyed an innovative drone flying incursion by SWCC. During a 10-minute flight orientation session, the students took the controls of seven mini Mambo drones weighing 63 grams each and flew these within large cages under the careful watch of SWCC staff. SWCC biodiversity project manager Derani Sullivan and Department of Biodiversity, Conservation and Attractions officer Maria Lee gave students an insight into the conservation work underway at nearby Toolibin Lake, one of only three Ramsar-listed lakes in the South West region. Local Aboriginal Elder Les Eades also shared his traditional knowledge of Toolibin Lake. To further hone their drone-flying skills, the students participated in a ‘native seeding’ simulation by distributing small pellets from a drone around the edge of a representation of Toolibin Lake. The students also enjoyed a ‘migration’ simulation using the drones to learn about the unique bird life of the catchment. Miss Sullivan said the lesson not only exposed the honorary ‘Mambo Drone Pilots’ to drone technology but to important local history and conservation issues. “This was a fantastic opportunity to teach the students about relevant environmental issues and how technology can help land managers to protect and restore the landscape,” she said. SWCC chief executive officer Steve Ewings said the unique incursion was designed so children could apply their understanding of science, technology, engineering and mathematics (STEM) in new and exciting ways. 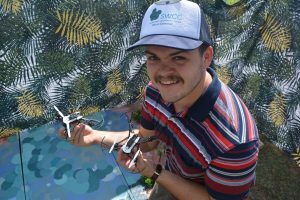 “Drones are being used for many positive reasons and are playing an increasingly important role in agriculture and Natural Resource Management (NRM),” Mr Ewings said. SWCC has Civil Aviation Safety Authority (CASA) certification to use its fleet of drones for multispectral, thermal and survey-grade imaging services. SWCC is planning other school incursions within the South West Region so if your school is interested, contact [email protected] for more information.